Jamieson Ridenhour is the author of the P.G. Wodehouse-meets-Lon-Chaney murder mystery Barking Mad (Typecast, 2011) and its sequel Mad Dogs and Englishmen (Typecast, forthcoming 2014), as well as the short films Cornerboys and The House of the Yaga (both featured at GeekNation.com). His poetry and fiction has been published in The Lumberyard, Pseudopod, Strange Horizons, and others. In Darkest London, a study of the Victorian Urban Gothic, was released in 2013 by Scarecrow Press. Jamie lives and writes in Bismarck, North Dakota. It’s easy to get caught up in the sound and imagery of this poem, how the s and t sounds repeat in a phrase like “bristle-stiff/ skin parts like drapery,” how that same phrase honors the animal’s beauty without flinching from the hunter’s task. 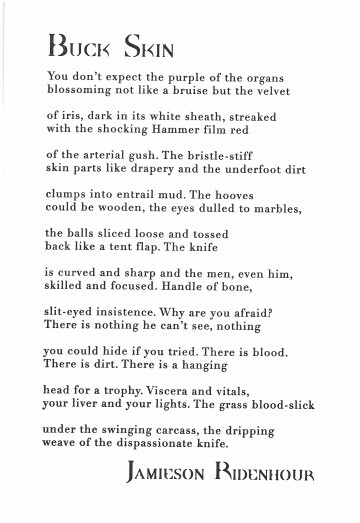 What really makes this poem hum, though, is its central question: “Why are you afraid?” Surely seeing a deer disemboweled for the first time creates some of it, confronting the blood and viscera that precede a trophy and a meal. But if that were the poem’s only concern, it would amount to nothing more than a cheap shock. Instead the poet shows us the mess then steps back to consider how “skilled and focused” the men are. This is old hat to all of them, “even him,” a man singled out again as the speaker tries to calm his fears. “There is nothing he can’t see,” nothing about killing and gutting a deer that is shameful, and yet the speaker’s heart tells him otherwise. “The knife/ is curved and sharp” the better to take apart the deer’s body, layer by layer. The typeface needed to have a similar shape, something with marked contrast in its strokes, plus round bowls. The s’s and o’s of Didot provide that shape, an echo of the knife sliding, half hidden between skin and muscle, then flashing visible as it cuts the organs loose. DpQuake goes a step further; the thin, horizontal strokes disappear entirely as the knife bites deep.